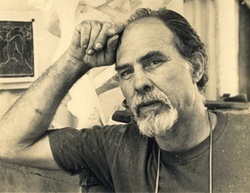 Henry Bianchini was born in 1935. Since settling in Hawaii in 1969, he has distinguished himself internationally as a sculptor, painter, printmaker, and craftsman. He has earned several Hawaii State Foundation on Culture and the Arts commissions, as well as numerous corporate commissions and awards. Henry works with a wide variety of materials, including bronze, stone, concrete, steel, ceramics, wood, clay, and paper in his own foundry, kiln and production studio. His experience includes creating and installing works that are part of overall building and landscape design (gates, walls, sculptural installations). Henry has a strong sense of Hawaiian culture and art and an affinity with early Hawaiian voyagers. He originally sailed to Hawaii from Southern California on his self-built trimaran, “Island Dancer” in August 1969. As he approached the Island of Hawaii, he viewed the eruption of Mauna Ulu from 200 miles at sea. The experience left him with a unique sense of the dynamic and creative forces manifested in the Island of Hawaii, his home for more than 50 years.